After reading the first Vampire Empire book years ago, I was concerned I wouldn't be captured by The Rift Walker. I was pleasantly surprised! If you haven't read the first book in this series, go do it now. No, seriously, I'll wait. Go ahead. Okay, now that you've purchased and read The Greyfriar, we can talk about The Rift Walker. This book picks up shortly after the first one and dives in quicker to the meat and potatoes of the plot. Of course, this is to be expected since all the (superb) worldbuilding was done in the first book, allowing us the reader to seamlessly fall into this book without unnecessary backtracking. The world is on the brink of war with the vampires to try and wipe out the threat they pose. That's where Adele's marriage to Senator Clark would come into play–he's an accomplished war hero and inspires the confidence in the people that he'll be able to eradicate the blight of vampires that's been upon them. Adele has been holding off the wedding for as long as she can, claiming that she still needs to heal from her previous ordeal with the vampires. Meanwhile, there are plots brewing in Equatoria that intend to throw the government into chaos. There was really a lot going on in The Rift Walker, and there wasn't a single chapter without some game-changing scene. Just when you think the story will go one way, there will be a reveal and it'll about face to the other direction. There are several perspectives, so we get to see the side of not just our heroes, but our villains too. I loved that aspect, as it creates a very well-rounded story telling. One of my fav things about this series has always been how wonderfully the entire cast of characters is portrayed. Each character has a very clear motive and purpose. Of course, Adele and Gareth are the heart and soul of the story, and I loved seeing their relationships grow. Other than that, we got to know much more about other characters in the book, such as Mamoru who is Adele's tutor. You can purchase The Rift Walker as a Kindle version, and as a Paperback. We are a married couple who have written together for nearly two decades. 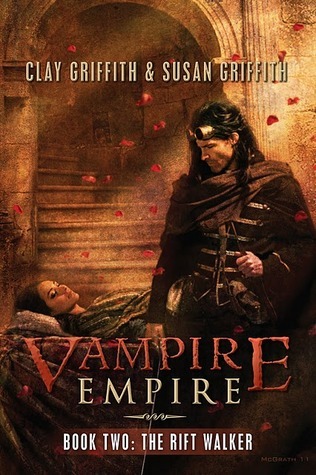 Our credits include novels such as the VAMPIRE EMPIRE series (Pyr Books) and the CROWN & KEY trilogy (Del Rey). We've written numerous short stories for anthologies, some featuring noted genre characters such as Kolchak the Night Stalker and The Phantom. We have also scripted comics including The Tick, The Simpsons, Allan Quatermain, and Vincent Price Presents. And we've written scripts for the television/web series Monster Creature Feature. We met one day at a bookstore over a copy of The Uncanny X-Men #201. Later we were married in Greyfriars Kirk in Edinburgh, Scotland. We share a love of romantic pulp adventure and classic movies. Susan is a native of upstate New York and a graduate in SUNY-Albany in English. Clay is from North Carolina and has a master's degree in African History from NC State University. I'm giving away a paperback copy of The Rift Walker! US only. Must be 18 years or older.